The last week was an interesting one. I didn’t think I’d end up getting a stomach bug that would knock me out for Monday at work. My friend/co-worker’s father died so I worked dayside. Tuesday quickly came and Stacie, Josh and I grilled out on the Viaduct. We forgot the fact that sometimes you want dessert after BBQ’ing. Next time, add s’mores ingredients to the grocery list. Quickly up for Wednesday which proved to be a long day at work and play. I got out of work and rushed home to see the Dinosaurs. If you have young kids who aren’t afraid of very realistic dinosaurs, don’t hesitate to go. 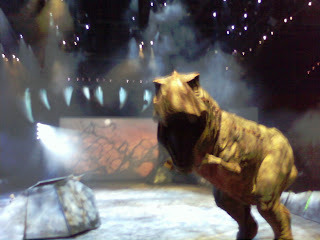 I didn’t get to post much of a review about “Walking With Dinosaurs” but the show is very well done. I think it’s just as fun for the adults to figure out how the dinosaurs work as it is for kids to see them in action. I was surprised at all of the kids around me knowing so much about the animals. They shouted out their names when they’d take the stage. There are some fun moments with the announcer when he talks about “poop”. Rodger, Rebecca, Stacie, Josh and I all had a good time. We stopped at Flat Iron Cafe for dinner after the show. 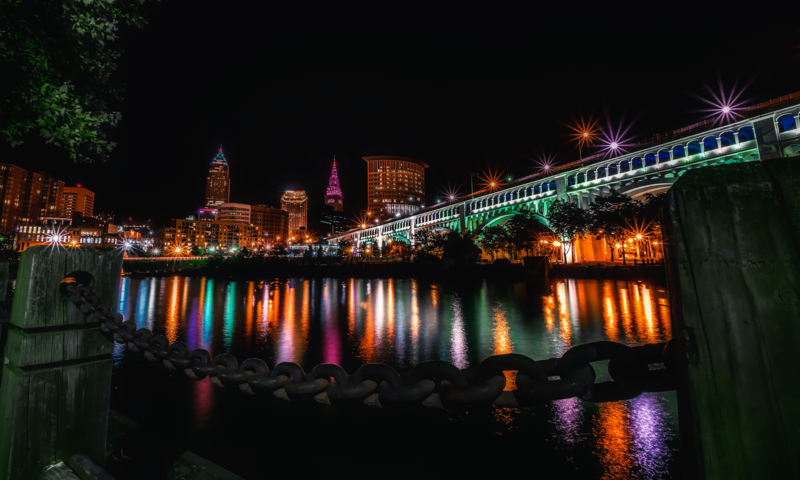 The production at the Quicken Loans Arena started around 7:00pm and ended by 9:45pm with a 20-minute intermission. Eight hours of sleep later, it was Thursday already. 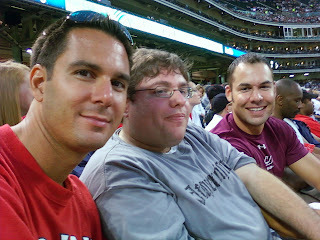 Jason, Russ, his friend and I braved the elements and watched the Indians take on the San Francisco Giants. We won but we didn’t sit through the entire game because it got started so late. The crowd gave Omar Vizquel a standing ovation as he returned again to the place he knew as Jacobs Field. We apparently made STO’s coverage of the game several times because of where our seats were. Several foul balls came whirling out our way. I think a fan got hit with a line drive foul ball. The ushers brought someone in to check the person out. I didn’t see them take the person out on a stretcher so I only could assume she was okay. I will have to admit if it got all of the way to me, it’d sure knocked me out. The Indians ended up winning the game by a score of 4 to 1. C’mon comeuppance!! By Friday, I was tired by the time I left work. Josh, Dan and I went to Ro k Bottom to get some food and it was low-key. We played table shuffleboard, I took the first game against Dan. Josh won the next one but only by a couple of points. In bed and done by 11:30. This morning, I’m off to volunteer at a non-profit. I get to hang with some kids and hopefully brighten their day with some ice cream. No plans yet for tonight but part of my day will be spent working out and cleaning up my place that is certifiably a bachelor pad. It’s a right mess!